Apple Crisps is one of the easiest and tastiest desserts. A couple of weeks back, I had few apples which were starting to rot. I wanted to use them but not in a mood to prepare smoothie or milkshake. When I browsed the Internet, I came across this video. I loved it and wanted to try it. This dessert is very simple and when served warm with a scoop of vanilla ice cream, takes you to heaven. A perfect party dessert and you can store it in an air tight container and reheat it before serving. It stayed good for 3 days. In a bowl, add all the ingredients and with the help of two knives (as shown in t he video) or your fingers make them to a crumble mixture. Peel the apples and cut them into slices removing the center part. In a baking dish, spread these sliced apples and top it with the crumbled mixture. Bake it for 50 - 55 min, until the apples are well cooked and the top is golden brown. Cool it for 5 min and then serve with a scoop of Ice cream of your choice. If serving for a party, prepare this dessert well ahead and refrigerate it in an air tight container. 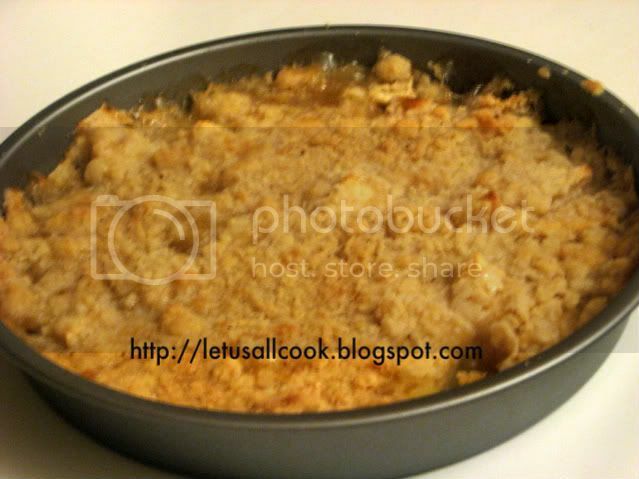 Just before serving, reheat the apple crisp and enjoy! Can I join in this party? Nice way to use up apples other then just eating them as it is. nice and delicious..i dont have butter now..otherwise i would have treid this immediately.. I have a recipe for Pumpkin halwa...but I haven't tries pineapple halwa yet. So w ill surely give you once I make it. Hi Sangeeth, What a delicious and simple recipe. I love desserts with apple, so I am sure I am going to enjoy this one. Cheers! Apple crisp is one of my favorite desserts, it's so good year-around!